MPAA Rating; PG-13 (reviewer’s note: the violence borders on R territory) for extended and intense sequences of Western violence, and for historical smoking, some language and suggestive material. Running time: 133 minutes. Released by Metro-Goldwyn-Mayer and Columbia Pictures. With those words, so begins one of the most bloody and violent Westerns I have ever seen. More violent than Clint Eastwood’s Unforgiven, in which the violence was not only handled well, but startling in its stark and personal nature. More violent than Sam Peckinpah’s controversial The Wild Bunch, featuring some of the most over-the-top examples of shock filmmaking in its gunfights. 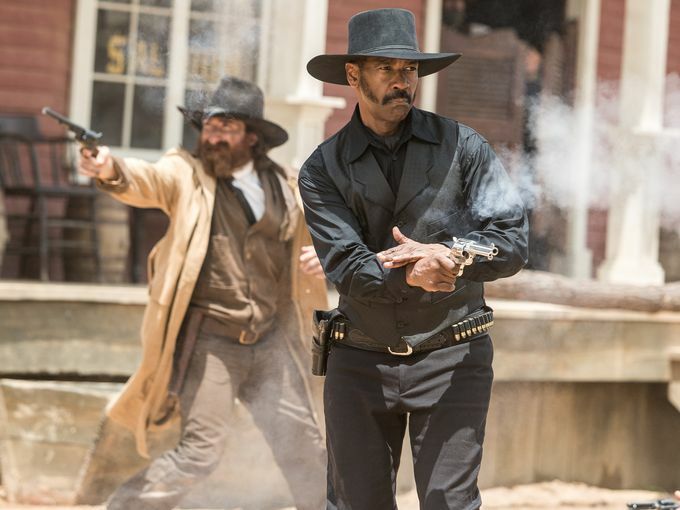 How director Antoine Fuqua managed to talk the MPAA into granting his remake of The Magnificent Seven a mere PG-13 is beyond me, considering the realistic quality of the continued slaughter that runs through its 133-minute entirety. I’m not a prude when it comes to violence, lest you wonder; it’s just that the rating seems a bit lenient to me. Maybe it’s more of an indicator of where we are at this point in cinema history. 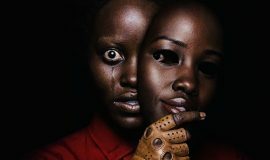 It’s not enough to be edgy and to have a good story; films like these are merely vehicles to push it hard, fast, and loud, not caring a whit if they get a little of it on you. 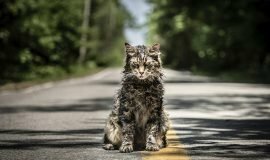 However, what can be done when The Hollywood Remake Machine churns out a reinvention of a hallowed classic – which, in itself, was a remake? 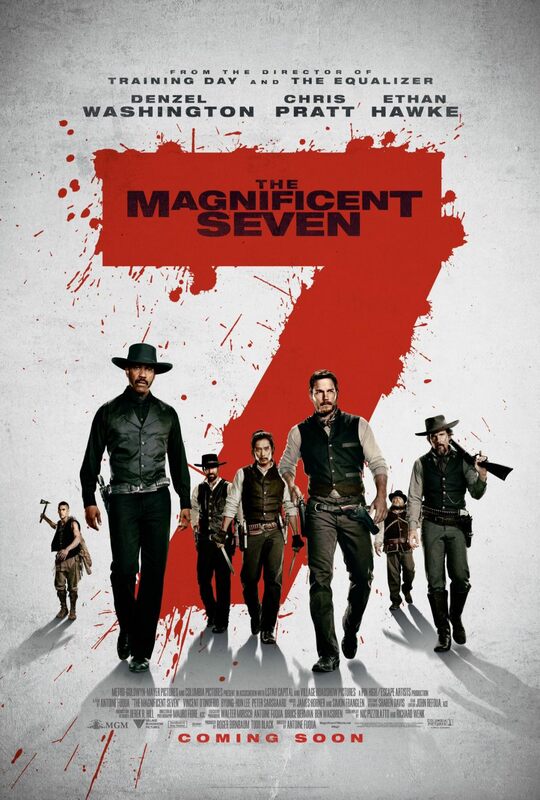 1960’s The Magnificent Seven was only six years removed from its origins as Seven Samurai, one of director Akira Kurosawa’s most noteworthy films. In the intervening 62 years since Kurosawa’s original, film technology and techniques have changed and improved, but the nature of storytelling has not, which is a deficiency in Fuqua’s remake. Aside from the eye-popping violence, there’s not much which stands out storywise or scriptwise in Fuqua’s remake. 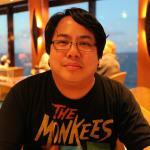 Instead, he lets the cinematography and performers do the talking. Director of Photography Mauro Fiore, shooting on glorious anamorphic 35mm film, uses every last bit of the frame to let the audience drink in the landscapes and action, and to enjoy the detail with which Fuqua and Production Designer Derek R. Hill pack every scene. The costumes, set design, and scenery are all given center stage while an able cast takes their turns mugging for the camera. Relying completely on his stars’ respective screen presences, Fuqua does little else but let the titular Seven shoot, stab, and shine their way through the film. Playing the leader of the Seven, Sam Chisolm, Denzel Washington can always be counted on to turn in a solid, stalwart performance with his magnetic, larger-than-life swagger. Chris Pratt’s character, Josh Farraday, the goofball with the fastest hands in the West, isn’t that much of a departure from his usual goofball roles; however, he’s put to good use here, providing much of the film’s comic relief. True, the other actors are given their moments in the sun, but – like most films these days – they’ll be whittled down to more caricature than character by film’s end. Herein lies one of this film’s largest problems. Are we watching a comedy, or a film about a small town turning to a band of hitmen-for-hire to rid themselves of the tyrant crushing them under his bootheel? Too often, Nic Pizzolato and Richard Wenk’s script comes up empty on depth, turning instead to meager one-liners, pranks, and laughs to propel the camaraderie between the Seven and the townspeople of Rose Creek. The only person conveying Rose Creek’s desperate situation throughout the film is widow Emma (Haley Bennett), after slimy filthmonger Bartholomew Bogue (Peter Sarsgaard) shoots her husband in cold blood for no other purpose than to make an example of what happens to people who plot against him. The opening minutes set a brutal, vicious tone which lasts for the duration of the film, but it’s waylaid by the off-the-cuff, comedic way our heroes shrug off the value of human life. Maybe it’s the you-could-die-tomorrow outlook with which the Seven treat themselves and everyone around them. Yes, we’re obviously here to see the rapport between the actors, but this is certainly an odd vehicle for it. The Magnificent Seven and Seven Samurai were about how seven mercenaries look past the money they’ve been given to protect a town and become endeared to the townspeople. Losses were heavily accounted for and given their appropriate due. 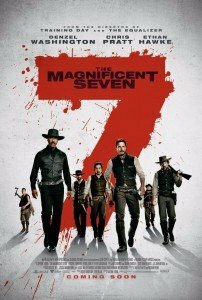 Fuqua’s The Magnificent Seven is little more than a latter-day thriller meant to pack audiences into seats and give them a rush from watching their favorite actors do a Western picture. It’s a modern cross of Unforgiven and John Landis’ Three Amigos with the brutality of Quentin Tarantino’s revenge drama Inglourious Basterds. The themes and symbolism of the originals are lost, replaced with volume knob-cranked action and forced comedy. And when Emma Cullen’s final narration ends with a line so unforgivable, you’ll be laughing not with the film, but at it. This remake has fun with itself, which is no problem; the problem is that it gives us nothing to think about afterward other than how badly our ears hurt from all the passionless gunfire and explosions. However, like I said, Fiore’s cinematography is wonderful, so at least that’s something.